Guest review by Mikey Anderson student in the “Comics Narratives: Illness, Disability, & Recovery” course, Art Therapy Program, School of the Art Institute of Chicago. 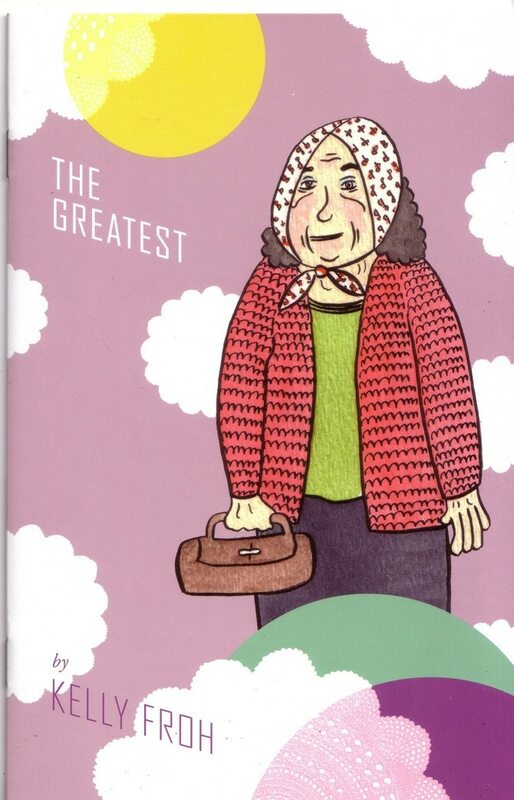 “The Greatest” is a beautifully crafted comic book with colorful illustrations, inviting characters, and an easy read. The comic book is a memoir to honor some of the amazing seniors Froh worked with as a caregiver at an assisted living facility in Wisconsin. She has a true passion for working in the aging community and is depicted in the care she takes to create each portrait of the individuals who have impacted her heart. Her short introduction provides the reader a playful entry point into her story by quoting her clients who say things like “This is me, kid, love it or leave it.” Froh reports she is truly inspired to be like them when she reaches her senior years. Her comic book is taking a step toward removing the stigma placed on the aging community. Froh clearly believes seniors contribute to our world because they carry with them history and knowledge that can pave the way for younger generations. The comic book breaks from the traditional use of panels, instead utilizes each page as a dedication to an individual senior she worked with. Her portraits are playful, colorful, flowy, and detailed. She juxtaposes each portrait with text about the senior she is drawing to highlight their unique personality. As a reader I enjoyed getting to know each client’s positive statement and wanted to meet them! The details she used to create their clothing, accessories, and rosie cheek captures the personalities of the clients so richly. As a reader I wanted to know more about each character and would of like Froh to elaborate on each of these individual’s stories. Each page has a statement about the seniors, but I want to know why someone has the greatest stories from the 60’s? What are some of those stories they had shared with her? Future books should incorporate people of color to create a more inclusive comic book. With her whimsical and joyful artistic style, it would just add a cultural lens to the comic book. Overall the comic book is beautifully and thoughtfully crafted to highlight the impact the individuals from the assisted living home had on Froh’s life. It’s a comic book that is removing the stigma around aging and embraces the often charming nature of seniors.